Our Funarena! : IPL Fixing Scandal: Son-in-Law Chargesheeted, Father-in-Law Still Wants To Be In Charge! IPL Fixing Scandal: Son-in-Law Chargesheeted, Father-in-Law Still Wants To Be In Charge! 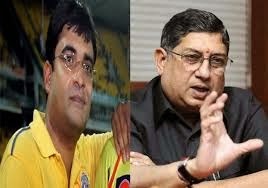 Mumbai Police today chargesheeted Gurunath Meiyappan, the former Boss of IPL franchise Chennai Super King (CSK) and son-in-law of the step-aside BCCI Boss N Srinivasan, for betting and leaking crucial team information along with Bollywood actor Vindoo Dara Singh and twenty others. Pakistan umpire Asad Rauf and 15 bookies were also named as ‘wanted accused’ in the 11,500 pages long chargesheet filed four months after the IPL Spot Fixing Scandal rocked Indian cricket and the world of cricket. Gurunath Meiyappan who was arrested on 25th May, 2013 has been charged under section 66A of the Information Technology Act, sections 4 and 5 of the Gambling Act. He has also been charged under sections 465 (forgery), 466 (forgery of record of court or of public register), 468 (forgery for cheating), 471 (using as genuine a forged document), 490 (breach of contract), 420 (cheating), 212 (harboring the offender), 120B (criminal conspiracy) and 34 (common intention) of the Indian Penal Code. Vindoo Dara Singh provided the Bollywood connection to the scandal and was allegedly working in close association with Meiyappan. Both of them were granted bail on 3rd June. As per reports they have been charged only for betting and not for spot fixing, maybe due to lack of concrete evidence. The next date for hearing on the chargesheet is fixed as November 21, 2013. ‘Unofficial’ owner of the CSK and ‘de facto’ Boss of the Indian Cricket Board BCCI, N Srinivasan termed his son-in-law as just an ‘enthusiast’ when Meiyappan’s name came up in the scandal, but as the muck gathered his Board was forced to suspend Meiyappan. Now, N Srinivasan washes his off on his son-in-law saying that Meiyappan was already suspended and will have to face it entirely on his own as the law takes its due course. Well, the ‘doting’ dad-in-law cannot risk any link to any of his family members or friends simply because he cannot afford to give up on his hopes of bossing the BCCI again. During the peak of the IPL Fixing Scandal involving his own team and his own son-in-law plus the national clamor for his resignation he was, of course, forced to step aside, but he managed to do it in such a way that his clout over the BCCI was never impaired. Now, he is set to seek reelection as the President of the BCCI at the Annual General Meeting scheduled for 29th of September, 2013 in Chennai and he exudes full confidence in garnering the required votes. Meanwhile, Asad Rauf claimed his innocence from the IPL Fixing Scandal while reacting to he being named in the chargesheet. When corruption is the mantra for a degenerating country you can only imagine how many million chargesheets would be required to effect some clean sense in. Be it cricket or sports, politics or anything. We can only hope for positive developments. Let the good things happen…faster…effectively.